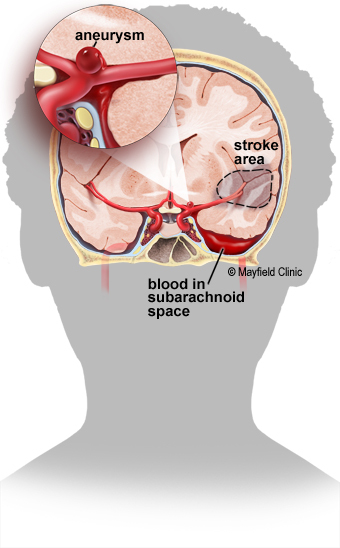 Subarachnoid hemorrhage (SAH) is a life-threatening type of stroke caused by bleeding into the space surrounding the brain. SAH can be caused by a ruptured aneurysm, AVM, or head injury. One-third of patients will survive with good recovery; one-third will survive with a disability; and one-third will die. Treatment focuses on stopping the bleeding, restoring normal blood flow, and preventing vasospasm. The subarachnoid space is the area between the brain and the skull. It is filled with cerebrospinal fluid (CSF), which acts as a floating cushion to protect the brain (see Anatomy of the Brain). When blood is released into the subarachnoid space, it irritates the lining of the brain, increases pressure on the brain, and damages brain cells. At the same time, the area of brain that previously received oxygen-rich blood from the affected artery is now deprived of blood, resulting in a stroke. SAH is frequently a sign of a ruptured aneurysm (Fig. 1). Figure 1. A subarachnoid hemorrhage caused by a ruptured aneurysm. As blood fills the space between the brain and skull, a blood clot forms, causing increased pressure on the brain. Enclosed within the rigid skull, clotted blood and fluid buildup increases pressure that can crush the brain against the bone or cause it to shift and herniate. Blockage of the normal CSF circulation can enlarge the ventricles (hydrocephalus), causing confusion, lethargy, and loss of consciousness. Vasospasm is a common complication that may occur 5 to 10 days after SAH (Fig. 2). Irritating blood byproducts cause the walls of an artery to contract and spasm. Vasospasm narrows the inside diameter (lumen) of the artery and thereby reduces blood flow to that region of the brain, causing a secondary stroke. Figure 2. When red blood cells break down, toxins can cause the walls of arteries nearby to contract and spasm. The larger the SAH, the higher the risk of vasospasm. If you or a loved one experiences symptoms of an SAH, call 911 immediately! SAH caused by injury is often seen in the older people who have fallen and hit their head. Among the young, the most common injury leading to SAH is motor vehicle accidents. Five to 10% of strokes are caused by SAH. When a person is brought to the emergency room with a suspected brain hemorrhage, doctors will learn as much as possible about his or her symptoms, current and previous medical problems, medications, and family history. The person's condition is assessed quickly. Diagnostic tests will help determine the source of the bleeding. Computed Tomography (CT) is a noninvasive X-ray that provides detailed images of anatomical structures within the brainand to detect any bleeding. CT angiography (CTA) involves the injection of contrast into the blood stream to view the arteries of the brain. Lumbar puncture is an invasive procedure in which a hollow needle is inserted in the low back to detect blood in the cerebrospinal fluid (CSF). The doctor will collect 2 to 4 tubes of CSF. If the CT scan does not show evidence of bleeding but the patient’s symptoms are typical for SAH, a lumbar puncture may be performed. Magnetic resonance imaging (MRI) scan is a noninvasive test that uses a magnetic field and radio-frequency waves to give a detailed view of the soft tissues of the brain. An MRA (Magnetic Resonance Angiogram) involves the injection of contrast into the bloodstream to examine the blood vessels as well as structures of the brain. Treatment for SAH varies, depending on the underlying cause of the bleeding and the extent of damage to the brain. Treatment may include lifesaving measures, symptom relief, repair of the bleeding vessel, and complication prevention. For 10 to 14 days following SAH, the patient will remain in the neuroscience intensive care unit (NSICU), where doctors and nurses can watch closely for signs of renewed bleeding, vasospasm, hydrocephalus, and other potential complications. Pain medication will be given to alleviate headache, and anticonvulsant medication may be given to prevent or treat seizures. 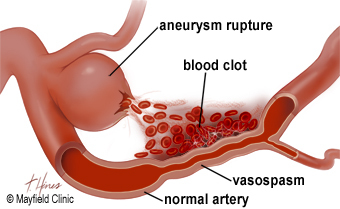 If the SAH is from a ruptured aneurysm, surgery may be performed to stop the bleeding. Options include surgical clipping or endovascular coiling. If the SAH is from a bleeding arteriovenous malformation, surgery may be performed to remove the AVM. Clotted blood and fluid buildup in the subarachnoid space may cause hydrocephalus and elevated intracranial pressure. Blood pressure is lowered to reduce further bleeding and to control intracranial pressure. Excess cerebrospinal fluid (CSF) and blood can be removed with: 1) a lumbar drain catheter inserted into the subarachnoid space of the spinal canal in the low back, or 2) a ventricular drain catheter, which is inserted into the ventricles of the brain. Five to 10 days after an SAH, the patient may develop vasospasm. Vasospasm narrows the artery and reduces blood flow to the region of the brain that the artery feeds. Vasospasm occurs in 70% of patients after SAH. Of these, 30% have symptoms that require treatment . A patient in the NSICU will be monitored for signs of vasospasm, which include weakness in an arm or leg, confusion, sleepiness, or restlessness. Transcranial doppler (TCD) ultrasounds are preformed routinely to monitor for vasospasm. TCDs are used to measure the blood flow through the arteries (Fig. 3). Figure 3. Transcranial Doppler (TCD) uses ultrasound to examine the arteries, measure blood flow, and look for signs of vasospasm. This test can show which arteries are in spasm as well as the severity. To prevent vasospasm, patients are given the drug nimodipine while in the hospital. Additionally, the patient’s blood pressure and blood volume will be increased to force blood through the narrowed arteries. If vasospasm is severe, patients may require an injection of medication directly into the artery to relax and stop the spasm. This is done through a catheter during an angiogram. Sometimes balloon angioplasty is used to stretch open the artery . Recovery and prognosis are highly variable and largely dependent on the severity of the initial SAH. In general, one-third of patients who suffer a SAH will survive with good recovery; one-third will survive with a disability or stroke; and one-third will die. SAH patients may suffer short-term and/or long-term deficits as a result of the bleed or the treatment. After a patient is discharged from the hospital, treatment may be continued at a facility that offers personalized rehabilitation therapies following a serious brain injury. A doctor who specializes in rehabilitation will oversee this care, which can include physical, occupational, and speech therapy. Common problems faced by patients following brain injury include physical limitations and difficulties with thinking and memory. Some of these deficits may disappear over time with healing and therapy. The recovery process is long, and it may take weeks, months, or years to understand the level of deficits incurred and for the patient to regain function. Speech and language deficits can make self-expression difficult. Aphasia is a total or partial loss of the ability to understand or use words. It is caused by damage to the brain's language center. Some people recover from aphasia after a brain injury, while others may have permanent speech and language problems. Less common problems include understanding what is being said or having trouble reading and writing. Weakness or paralysis in the arms and legs may occur following an aneurysm rupture. This problem usually affects either the left or the right half of the body and may include the arm, leg, and face. This weakness may improve over time, and rehabilitation may help a patient become stronger and learn to function at the best of his or her ability. Visual problems may occur because of bleeding into the eye or damage to the nerves that send or interpret signals from the eye to the brain. Seizures may occur after an aneurysm ruptures. During a seizure, part of the body may begin to shake or twist. Seizures usually stop on their own, but medicine is available to prevent seizures or stop them when they are occurring. A person who suffers more than one seizure is said to have epilepsy. Side effects of medications may produce rashes, itching, nausea, changes in appetite, and sleepiness. The doctor will review your past medical history to try to determine whether you are at risk of having a side effect. However, reactions to medications usually cannot be predicted, and the first clue likely will appear when you notice something different. Tell your nurse or doctor if you are having a problem that your medications might be causing. Fatigue is an overwhelming lack of energy that is commonly seen after a brain injury. The sleep lost in the NSICU also contributes to this fatigue. It may be present for many weeks after you are discharged from the hospital. Fatigue will decrease over time as your physical fitness improves. Regular sleep habits and daily naps will reduce your fatigue. Headaches are common after SAH. They tend to improve as time goes by. Short-term memory loss may cause you to not remember what you did this morning, or whom you talked to on the telephone. You could get lost while driving and forget how to go home or to other familiar places. You may have problems learning new things and remembering old things. Lack of attention and concentration may make it hard to stay focused on a task or problem. You may be easily distracted. Try to focus on one task at a time and do things in a quiet setting. Change in perception may make people, places, and things appear different than they did before your brain injury. An aneurysm survivor once likened her experience to coming home after a long trip and finding that everything in the house had changed. The house and furniture was still there, but everything looked and felt different. Difficulty with organization may make you forget how to go about daily chores such as cooking a meal, or cleaning your house. It is best not to do too many things at once. Using timers, pillboxes, calendars, notebooks, day planners, and voice recorders can be helpful. Personality changes can occur after a brain injury. These changes can range from a lack of get-up-and-go to mood swings to severe depression. You may become more irritable and may cry easily. Signs of depression should be reported to ensure proper professional help and medication. The following advice comes from physicians and survivors of brain injury: Moderate exercise, a steady sleep pattern, and a healthy diet go a long way toward providing the best chance possible for clear thinking and good conversation. Improving concentration skills and energy levels are two reasons to avoid tobacco and alcoholic beverages. Not expecting too much of yourself, or pushing yourself too hard. Not returning to work and doing a full work load too early. Ask for help from professionals who are familiar with the challenges related to your type of medical issue. Continue all therapies as needed. Be willing to ask and accept help from family and friends. Join a support group to meet and talk with people who have shared the same type of brain injury, recovery, and struggles. Discuss problems with your physicians and therapists at your follow-up visits. As your recovery progresses, the problems you face may resolve. If they do not, plans can be developed to help you cope with the changes you are facing. angioplasty: an inflatable balloon inserted through a catheter to stretch open a blocked or narrowed artery. cerebrospinal fluid (CSF): a clear fluid produced by the choroid plexus in the ventricles of the brain. CSF bathes the brain and spinal cord, giving them support and buoyancy to protect from injury. intracranial pressure: pressure within the skull. Normal ICP is 20mm HG. lumbar drain: a catheter inserted into the subarachnoid space of the spine to remove cerebrospinal fluid (CSF). Used to treat hydrocephalus or relax the brain during surgery. seizures: uncontrollable convulsion, spasm, or series of jerking movements of the face, trunk, arms, or legs. 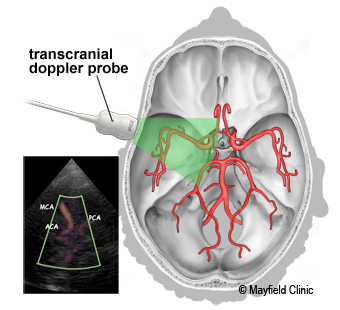 transcranial doppler (TCD): an ultrasound device used to measure blood flow through an artery in the brain. vasospasm: an abnormal narrowing or constriction of arteries due to irritation by blood in the subarachnoid space. ventricular drain: a catheter placed in the ventricle of the brain to drain excess cerebrospinal fluid. Every year Mayfield Brain & Spine treats more than 180 people whose lives are threatened by brain hemorrhages and aneurysms. Our neurosurgeons work collaboratively with neurologists, neuroradiologists, and neurointensivists to bring you the very best care available. Click here for information about clinical trials conducted by our doctors at local Cincinnati hospitals or call 1-800-325-7787 ext. 5260.